Namaste! The LOST TV series has inspired people from around the globe to create some of the best fan made art ever! 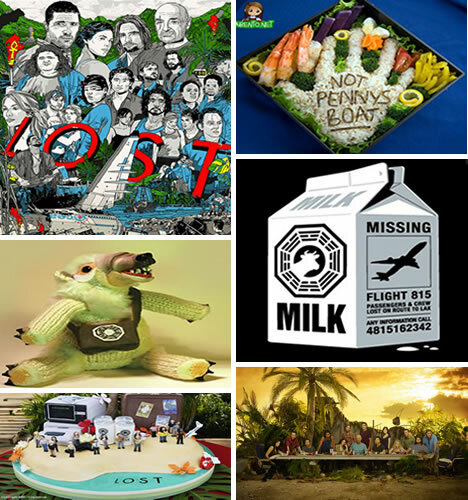 For six years, Lost fans have included amazingly talented artists with Lost-themed vision, incredible creativity, and an insatiable appetite for the island’s mysteries. Lost fans are now somewhere in-between a frenzy to having fun. Here is a huge collection of Lost fan art. Like LOST itself, some of the fan art is fantastic, while some is simply freaky and WTF?!? 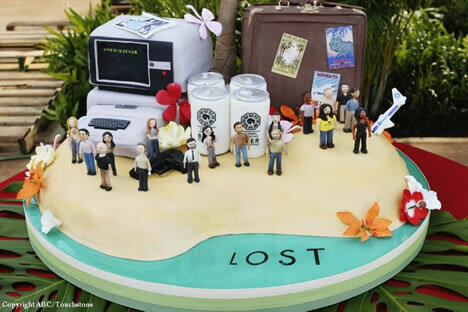 You may not be a fan of the TV series Lost, but the fans are diehards! Lost is almost over, with too many questions left unanswered. Whether or not that will leave an opening for a series of Lost movies on the big screen is yet to be known. However, the cult-like following will live on and continue to grow as new people watch reruns. 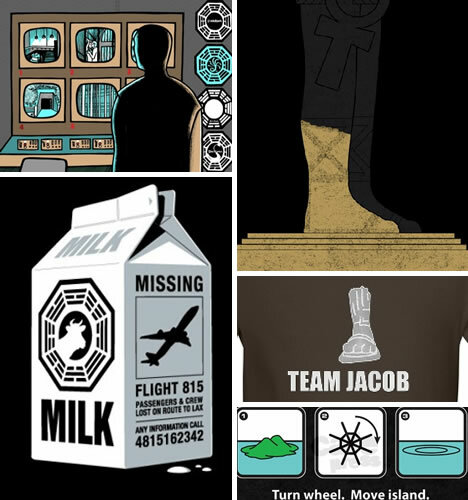 Here are some of the best or most freaky fan art in a goodbye tribute to Lost. 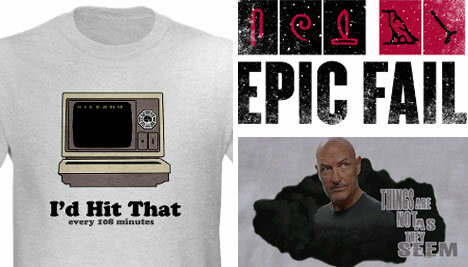 Lost is one epic WTF after another. The only “given” is to expect that things are not what they seem. If you know nothing of Lost, you will not understand the hieroglyphics or the countdown timer. Explaining it is for the experts, but once upon a time Oceanic Flight 815 crashed on the the island. The survivors found the Hatch and the Numbers had to be entered into the station’s computer. Execute needed pushed every 108 minutes to prevent system failure and the dreaded hieroglyphics (or end of the world). From Desmond Hume, to John Locke, to Mr. Eko, in fact everything about the island, was never what it seemed. Each episode included a minimum of one WTF moment, leaving fans to speculate until the next episode. 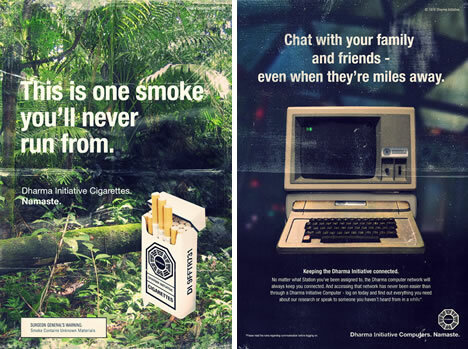 As a Lost fan, you see clues everywhere. The Numbers, also Hugo Hurley Reyes‘ “winning” lottery numbers, might be found in something as simple as minestrone soup. Everywhere you look, Lost is there. 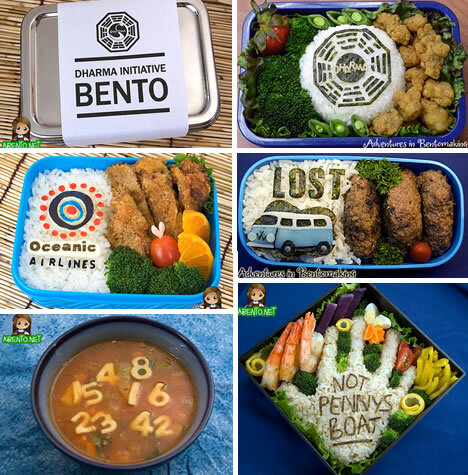 Crystal Watanabe creates the most fabulous Lost tributes as Bentos. Her site, Adventures in Bento Making, is a perfect example of how creative and diehard LOSTies can be. 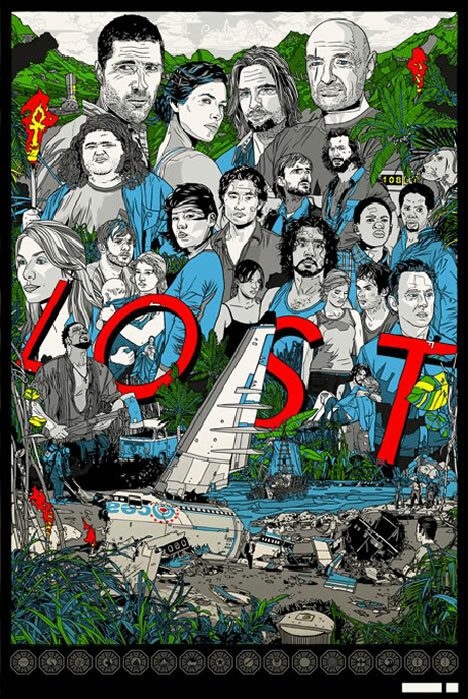 To celebrate the final season of the series Lost, a group of designers and artists who are also fans of the program were challenged to create screenprints of the most memorable moments in the unforgettable series. They are not the only ones with fan art. Glenn Jones creates t-shirts designs, including the Dharma milk carton. 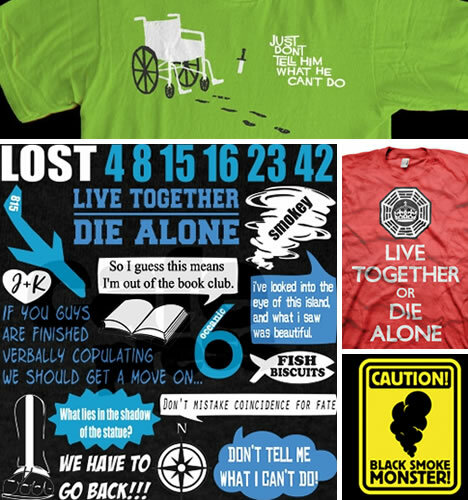 People all over the world have created t-shirt tributes to their favorite Lost character. This was part of the Lost Underground Art show at Gallery 1988 in Los Angeles. 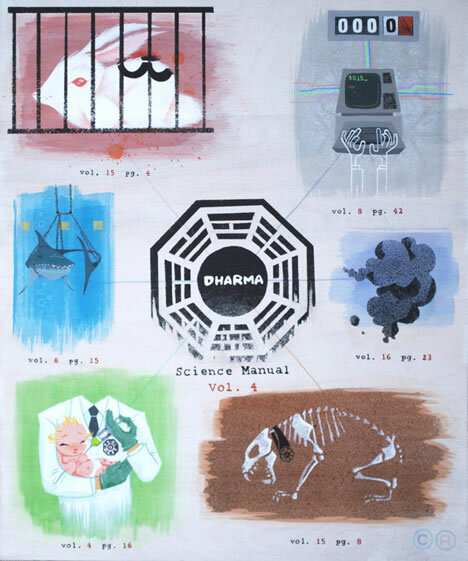 Created by artist Carlos Ramos and titled, “DHARMA Science Manual Volume: 4,” this 20 X 24 inch masterpiece sold for $975.00! Eric Tan designed “The Crash.” It was one of 300 hand-signed and numbered screenprints. Jason Casey created “Mr. Eko stares down the smoke monster.” Arinen drew Charlie Pace and “Not Penny’s Boat.” Buuya drew a different character like this “Benjamin Linus” every day of June. 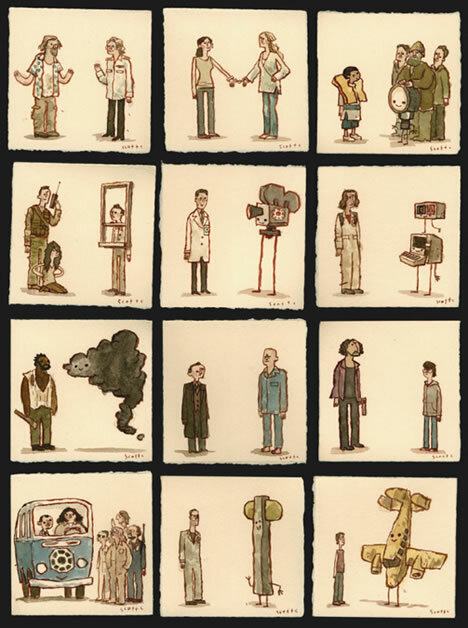 Scott Campbell created these framed 5 X 5 watercolor showdowns on archival paper. “LOST Showdowns” sold at the Underground Art Show for $350 each. If you are a Lost fan, then it goes without saying that you have an insatiable appetite for rehashed theories of flight Oceanic 815, of the black smoke monster, of the intriguing Dharma Initiative, of the parallel universes, of the island and all of its mysteries. Don’t get us started on Adam and Eve. Here are a few of the important logos, sayings, and clues, printed on shirts by diehard fans. 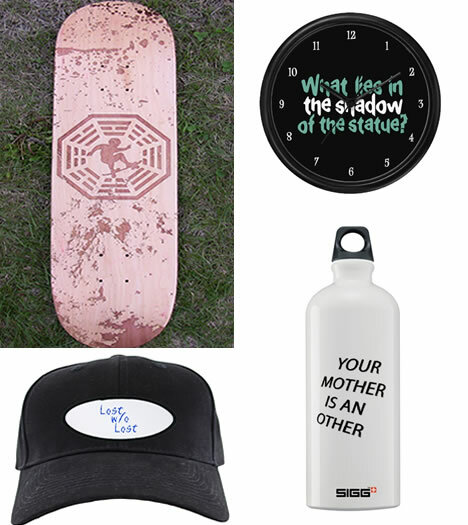 Here are a few more favorite Lost characters and a tiny drop in the bucket of t-shirt designs available in tribute to each. 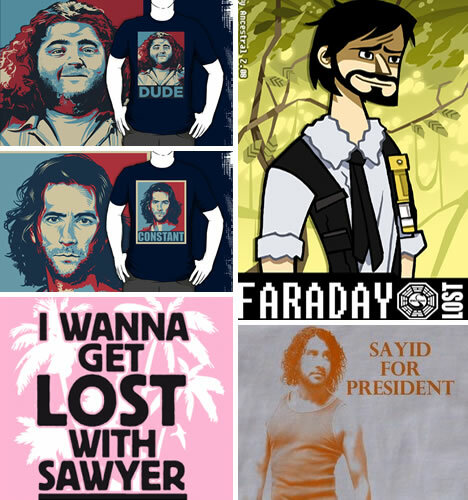 These are Hurley, Desmond, Dr. Daniel Faraday, James “Sawyer” Ford, and Sayid Hassan Jarrah. 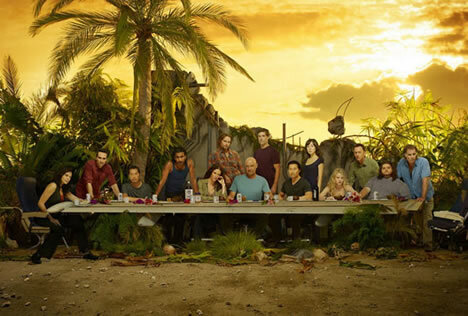 Depending upon how many questions are left unanswered, how many characters are offed, and how this epic TV series ends, Lost fans may break into worldwide riots in the streets. 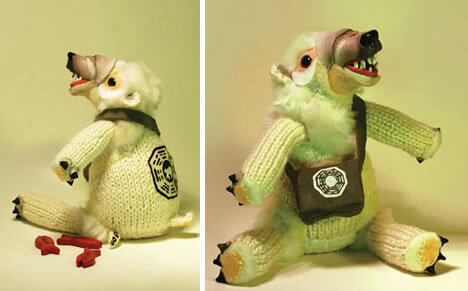 Do you like plush toys? When the polar bear charged across the tropical island, it was a giant WTF!?! This polar bear was created by Danielle Buerli and titled “The Dharma Bear.” This eight inch plush bear makes a roaring noise when squeezed and has small Dharma biscuits in a pouch. At the Underground Lost Art Show, it sold for $350! 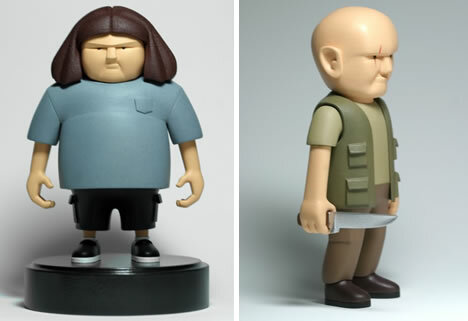 Wade Schin created these one-of-a-kind, five inch sculptures of Hurley and Locke. They have magnetic feet and bases for extra stability. At the Underground Art Show, each sold for $815! 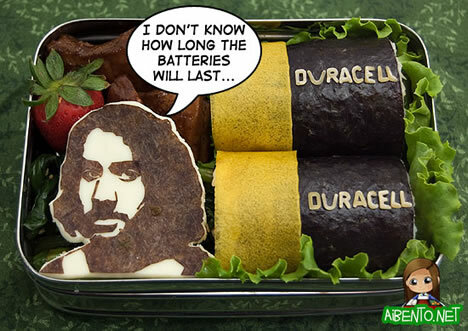 Almost any product you can think of has been turned into a Lost piece of art. From skateboards, clocks, hats, water bottles, it’s out there if you but look due to the awe factor of this highly addictive, intensely mysterious and controversial series. Some people hate Lost and will be happy to see it go. Even Lost fans like to bash Lost plots sometimes, but one thing rings true for all diehard fans. We will be lost without Lost. 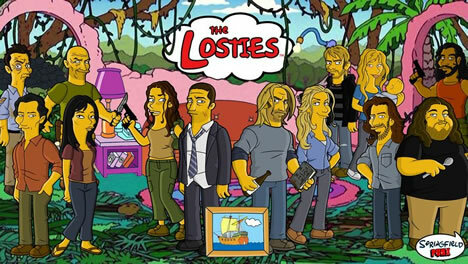 With six seasons, Lost has been turned into fan art and into toys for fans. 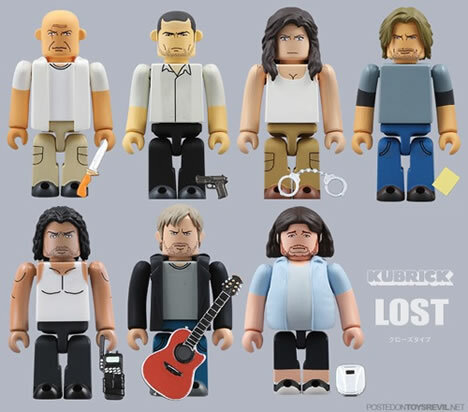 One example of Lostie toys are the Lost Kubricks from Medicom. 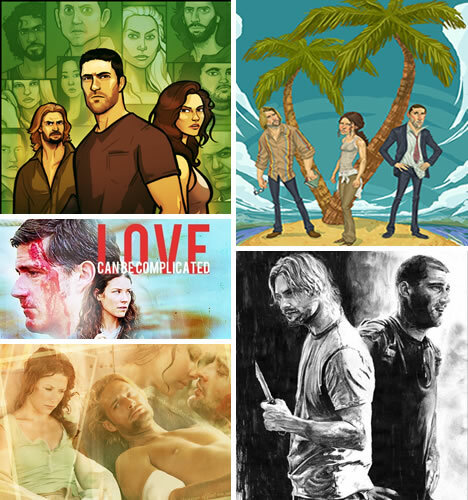 This series included Locke, Jack, Kate, Sawyer, Sayid, Charlie and Hurley. Tragedy seems to rule side by side with WTF!?! Hurley and Libby, Charlie and Claire, Richard, Locke and the hatch, Juliet and Ben, none escaped unscathed from tragedy. Lostpedia is a great source among thousands, perhaps millions, of sites which discuss or debate Lost theories. Ahh, love, what we would do without it? The love quadrangle between Jack, Kate, Sawyer and Juliet was just one of the dramatic conflicts that helped drive the plot. Jate is the fan-given name to the relationship between Jack and Kate while Skate is the fan-given name to the romantic relationship between Sawyer and Kate. These amazing works of art have had six seasons to grow. “LOST Season Four” is by grantgoboom. “LOST II” is by juarezricci. “Sawyer and Jack“ was drawn by RobD4E. Damon Lindelof and Carlton Cuse must have truly wanted to break our hearts and bring on the waterworks over the Kwons. Jin and Sun were blessed by Jacob on their wedding day. After Sun’s rescue, she gave birth to their daughter Ji Yeon. Once reunited on the island, that blessing by Jacob seemed like a curse. When Jin and Sun drowned together in the submarine, millions of voices around the globe shouted WTF?!? We, the fans, love Lost. 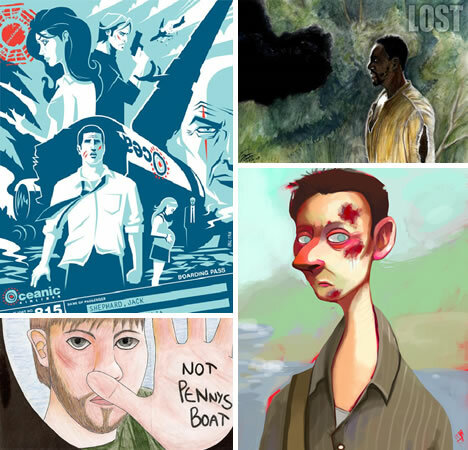 You’ve seen but a tiny sampling of awesome Lost fan art collected here. Six years later, we are still addicted and without answers to millions of questions. If you are not a Lostie, but know one, don’t call for we will have our phones off. We will be having parties. We will be ready and waiting for the Lost final showdown. To try to come between us and our beloved TV series may be hazardous to your health!